Today we had the first Solar Physics seminar for this academic year we were presented with an exciting piece of research investigating the prediction of solar flare events through studies of sunspot dynamics. 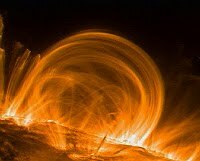 Solar flares occur due to the sudden release of energy stored in active-region magnetic fields. To date, the precursors to flaring are still not fully understood, although there is evidence that flaring is related to changes in the topology or complexity of an active-region's magnetic field. Understanding of these events thus require a study of reconnection phenomena. The seminar was introduced with a description of reconnection phenomena with descriptions of the Sweet-Parker model, Petschek model and collisionless reconnection. The study of Mason et al showed that Flare occurrence is statistically associated with changes in several characteristics of the line-of-sight magnetic field in solar active regions (ARs). 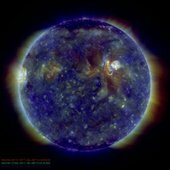 They calculated magnetic measures throughout the disk passage of 1075 ARs spanning solar cycle 23 and found a statistical relationship between the solar magnetic field and flares. 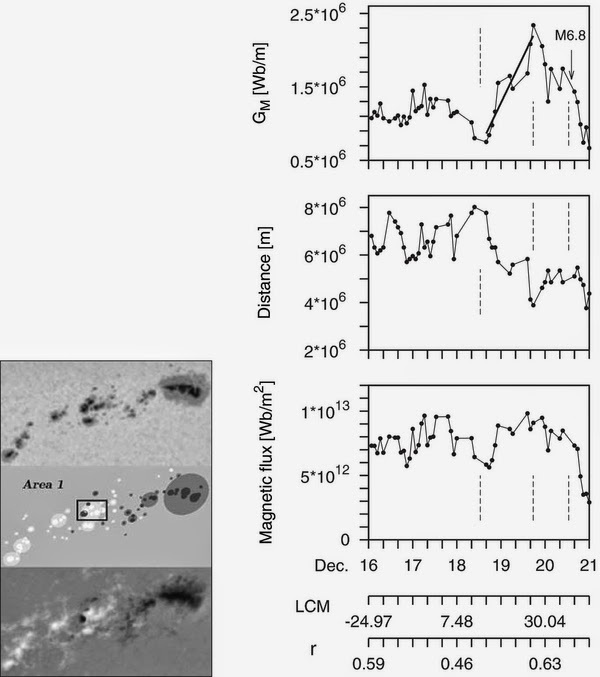 This study of over 71,000 magnetograms and 6000 flares uses superposed epoch (SPE) analysis to investigate changes in several magnetic measures surrounding flares and ARs completely lacking associated flares. Virtually all X-class flares produce a coronal mass ejection (CME), and each CME carries magnetic helicity into the heliosphere. Using magnetograms from the Michelson Doppler Imager on the Solar and Heliospheric Observatory, La Bonte surveyed magnetic helicity injection into 48 X-flare-producing active regions recorded by the MDI between 1996 July and 2005 July. Their survey revealed that a necessary condition for the occurrence of an X-flare is that the peak helicity flux has a magnitude >6×1036 Mx2 s-1. X-flaring regions also consistently had a higher net helicity change during the ~6 day measurement intervals than nonflaring regions. 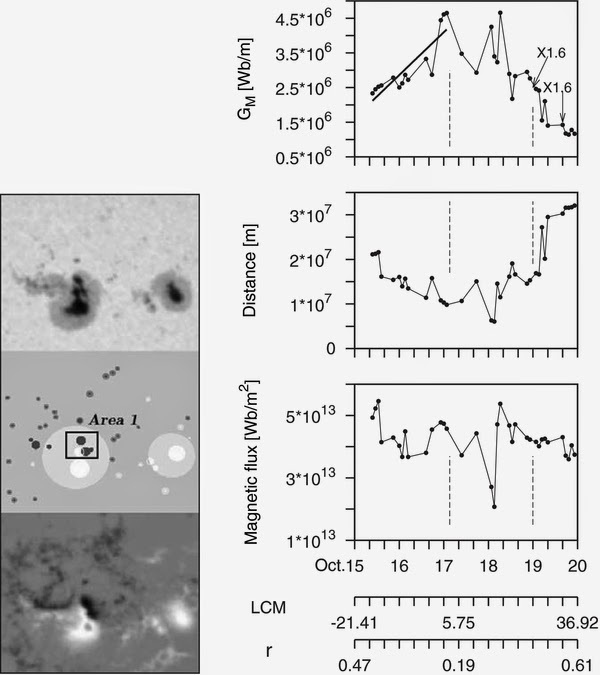 Murray examined the evolution of the magnetic field in active region NOAA 10953 the study used Hinode/SOT-SP data over a period of 12 hours leading up to and after a GOES B1.0 flare. The seminar presented a study of dynamic phenomena in flaring active regions and found diagnostically useful features for the assessment of risk, intensity and the time of imminent flares. Targeted features are sunspots and their data were taken from the SOHO/MDI-Debrecen Sunspot Data Catalogue (SDD). The method described employed an appropriately defined proxy measure of the non-potentiality at the photosphere, i.e. the horizontal gradient of the magnetic field between two subgroups of spots with opposite polarities at the polarity inversion line of the active region. The value and temporal variation of this proxy contains information about the expected time and intensity of imminent flares. Additionally, it allows an investigator to track the free energy content of the active region. The seminar picked out the results for a number of events e.g. NOAA AR9393 on March 28 2001 at 06:23 UT, NOAA AR9661 on October 17 2001 at 16:37 and NOAA AR10226 on December 19 2002, at 16:54 UT. Images and results from these are shown below. The figure above shows images of AR NOAA 9393: continuum image, reconstruction from SDD, magnetogram. The diagrams of the right column: variations of GM in areas 1 and 3; diagrams of area 2: variations of GM, distances, flux amounts. The two lower axes show the longitudinal distance from the central meridian (LCM) and the radial coordinate (r) of area 2. Results for the active region NOAA 9661. The results show a quick growth of the GM magnetic flux gradient defined by equation (2), this is not surprising, since this is the process of building up the non-potential component of the active region magnetic field. The rise takes about 1.5–2 days; the steepness of the strengthening is only weakly indicative of the flare intensity. The high maximum of GM at about 3 × 106 Wb m−1 is also obvious because this is the measure of non-potentiality in the given region. This maximum value shows the only unambiguous relationship with the intensity of the released flare. The results enable the derivation of a relation which can be used as a tool to estimate the intensity of the expected flare from the measured maximum of the flux gradient. There is a decrease of GM after maximum and until the flare onset. This might be the most surprising pre-flare signature because it would be expected that the state of strongest gradient is the most efficient trigger of the eruption. The after-maximum weakening prior to the flare may imply that the condition for the reconnection is not only the compression of the oppositely oriented flux ropes but also a subsequent loosening. There is significant fluctuation during the decrease, this is also a characteristic feature of the pre-flare dynamics, but it is not related to the flare intensity. Its measured values are between (3 × 105 and 6 × 105 Wb m−1 during the decrease prior to the X-flares, whereas it is 7.5 × 104 Wb m−1 in the quiet domain No. 1 of active region NOAA 9393. The obtained characteristics are mostly signatures for major flares. The flare class M5 as a lower threshold may seem to be arbitrary, but it can be justified. It was shown that for M4-class flares the maximum of GM is about 1 × 106 Wb m−1, while other results show that the fluctuation of GM may be as high as 0.7 × 106 Wb m−1; thus, the temporal variation of GM may be covered by the fluctuation in the case of weak flares. 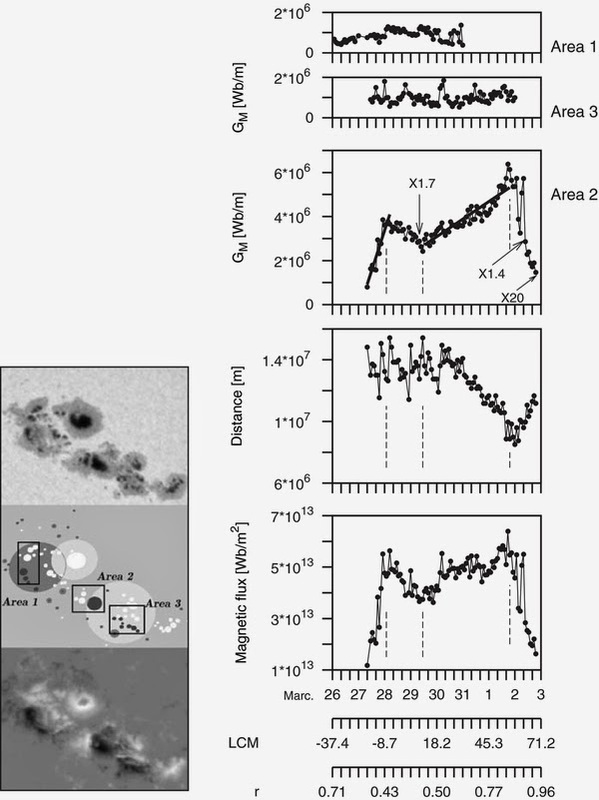 The recognizability of the presented behavior decreases toward weaker flares at about GM ~ 1 × 106 Wb m−1 and M4 class; it can be identified for flares more intense than M5. There were questions regarding the rules for assessing the sunspot grouping. For example, what is the criteria for selection of an area or spot group fluxes opposite polarity prior to flare indication of reconnection event? Future work will compare results generated from analysis in the photosphere to analysis in the Chromosphere. H. Ji, M. Yamada et al., Phys. Rev. Lett. 80, 3256 (1998).